The Benchmark team specialises in medical shop-fitting and medical practice design solutions. From concept to completion the Benchmark team is dedicated to helping you turn your vision into a reality. From our very first discussion, to space analysis, through to design and project delivery, we will be with you every step of the way as we design and build the ideal medical practice for your brand. So, wherever you are, we’re here to help you create the ideal medical practice. Email us today to find out how. With our commitment to quality and extensive experience in healthcare design, we can create the ideal medical practice to suit both your current and long-term needs. Here at Benchmark, we are passionate about designing spaces that truly fit the distinctive needs of our clients. We pride ourselves on our ability to easily understand the functional requirements of each unique project and our attention to detail and outstanding workmanship allows us to create environments that not only look professional but flawlessly meet the needs of those working within the medical profession. 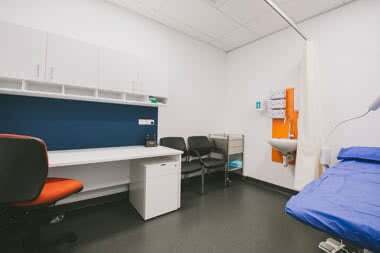 Benchmark Commercial Building Services is a design, build and fitout expert providing quality solutions for medical, dental practices and commercial spaces.